Here are approximately 200 excerpts from across the whole Bible, newly translated and provided with brief expositions, intended to introduce beginners to the significance of the whole biblical narrative, the richness of the poetry and the meanings which emerge from an attentive reading with the eyes of faith. The author, John Eaton, devoted his life to understanding the Hebrew Bible in its original language. This simple introduction reflects not only Eaton's linguistic and historical expertise but also his insight into the way modern critical reconstructions can facilitate the reclamation of New Testament perspectives on the foreshadowing of Christ in what became, for Christians, the Old Testament. Christ is at the heart of this work, for, daring to move from his specialist terrain, Eaton takes on the New Testament as well as the Old, selecting and translating key passages from the Gospels, and then other New Testament writings which illuminate the way of faith through Jesus Christ. So this book demonstrates the unity of the Bible, and how it may be read as Christian Scripture in a post-modern era marked by the biblical criticism of the modern period. "John Eaton was both a biblical scholar (known especially for his work on the Psalms) and a man of profound biblical faith. A Lantern to My Feet, his last book - he died in 2007 - reflects this rare combination. This memorial to his life's work is set to become a classic of biblical spirituality." 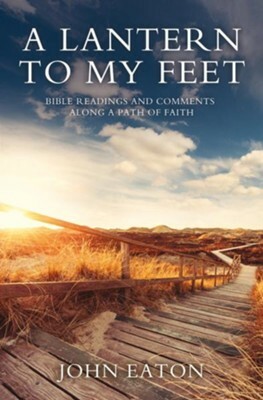 "A Lantern to My Feet is what you get when a good man, a faithful Christian and an Old Testament scholar writes his last book about the Bible - an inspiring legacy from faith and for faith. Read it from beginning to end or dip in anywhere and enjoy." "The book will serve as a wonderful resource for meditative reading." Born in Widnes between the Wars, JOHN EATON spent most of his professional life teaching in the Department of Old Testament at Birmingham University in the UK. A respected and well-known scholar, he wrote many books on the Old Testament, and particularly on the Psalms. He died in 2007, just after completing A Lantern to My Feet. I'm the author/artist and I want to review A Lantern to My Feet - eBook.